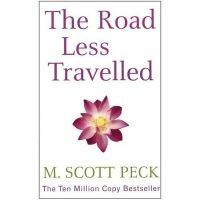 About The Book The Road Less Travelled (Arrow New-Age) is a self-help book written by M. Scott Peck. This book was written to help readers make the right decisions when they are are stuck at a crossroads. The book has three parts, with each section discussing a different aspect of life. In the first section, the book talks about the importance of discipline. The author writes that people need to balance their lives and that discipline is essential for emotional, spiritual and psychological health. The second part of the book discusses the nature of love, saying that it is the driving force of spiritual growth. Here, the author refutes the misconceptions associated with the idea of falling in love. He says that love is the willingness to extend the boundaries of your ego and accept someone else into your life. The third part deals with grace, saying that it is powerful force that nurtures spiritual growth in human beings. This section goes over a few factors that influence grace, like serendipity, the miracle of health and the unconscious. The author says these aspects are not understood by science and originate from outside our conscious will. The Road Less Travelled (Arrow New-Age) was published by RHUK in 1990 and is available in paperback. Key Features The Road Less Travelled made the bestseller lists in 1984. The book has sold more than ten million copies. Dr M. Scott Peck was a leading psychiatrist and bestselling author of inspirational self-help books. A graduate of both Harvard University and Case Western Reserve, Dr Peck served in the Army Medical Corps from 1963 to 1972 and had a private practice in psychiatry from 1972 to 1983. In 1984, he and his wife Lily helped found the Foundation for Community Encouragement, a nonprofit organisation which he devoted much of his time to until his death in 2005. See the author website: www.mscottpeck.com.